It’s been nearly three years since Korean pop star Psy’s “Gangnam Style” music video “broke” YouTube’s view counter, but rather than fading from public consciousness it is only becoming more of an emblem for the country and its capital. In mid-December, the district of Gangnam in Seoul will unveil a large bronze sculpture depicting the overlapping fists that are part of the viral video’s iconic horse-riding dance. 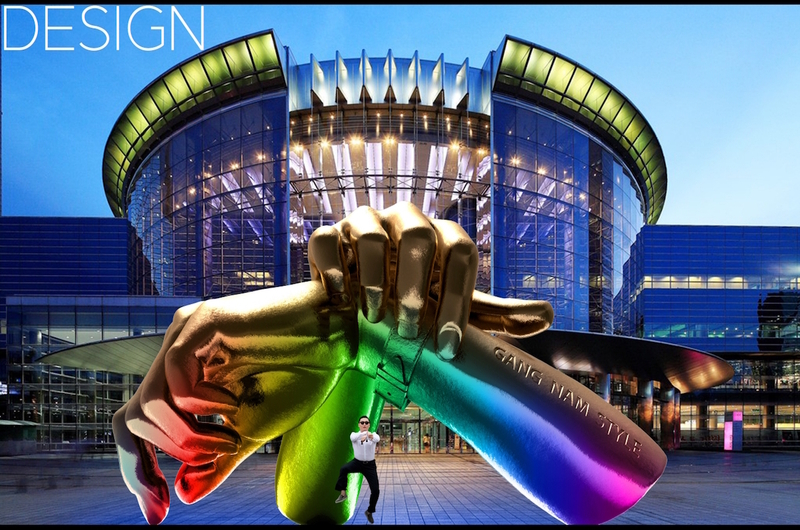 The sculpture, designed by the Visual Information Design Association of Korea (VIDAK), will be installed outside the COEX shopping center — where part of the video was shot — in hopes of boosting tourism in the district, as a press release stated. The release notes that while Chicago has Anish Kapoor’s “Cloud Gate,” New York has Arturo Di Modica’s “Charging Bull,” and Paris has César Baldaccini’s “Le Pouce,” Seoul lacks its own landmark sculpture. So what better one to erect than a tribute to a gesture that is perhaps the most globally recognized — whether with glee, annoyance, or grief — image to emerge from the region? According to local reports, the statue will cost 418 million won (~$361,000) to install, as announced by the district last month when it opened public bidding to fund the project. The bidding process closed the day before the official press announcement, which suggests that the 17-foot-tall work will soon become a reality. The golden hands will stand as a monument to Psy’s musical legacy in the wealthy and trendy district, just a mile away from the Hannamdong neighborhood, where the singer is building another reputation as a real estate mogul and trying to evict longtime artist tenants from a building he owns so it can be renovated.